Through the pioneering efforts of the famed British anthropologist E. E. Evans-Pritchard, the Nuer of southern Sudan have become one of anthropology's most celebrated case studies. 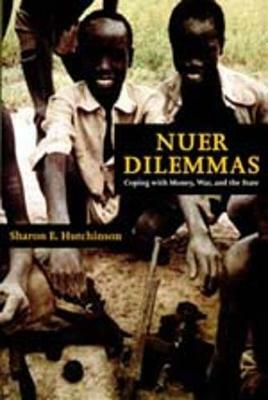 Now Sharon Hutchinson combines fresh ethnographic evidence and contemporary theoretical perspectives to show not only what has happened to the Nuer since their 1930s encounters with Evans-Pritchard, but, more importantly, what is to be gained from a thoroughly historicized treatment of ethnographic materials. Hutchinson's work provides a vision for what anthropology has become in the 1990s. Concentrating on Nuer perceptions, experiences, and evaluations of change, Hutchinson traces the historical conditions that have led contemporary men and women to reconsider fundamental aspects of their lives. She raises a number of important issues that Evans-Pritchard did not: How can we move beyond static structural models based on notions of cultural 'boundedness', 'homogeneity', and 'order'? How have Nuer people been actively reshaping and reassessing local forms of power in light of dramatic economic shifts, religious proselytizing, civil war, and colonial and post colonial rule? Hutchinson has produced a rich ethnographic document that offers a new rhetorical strategy for writing ethnographies that is processual, dialogical, and reflexive all at once.